This article in today’s Guardian is by Roger Scruton, a philosopher with a leaning towards Hegelian aesthetics. In it, he pleads for his concept of ‘conservatism’ and explains why it’s hard to ‘think’ conservative. He also fancies himself a composer and has become a keen apologist for Wagner, which is peculiar given Wagner’s own rejection of the Hegelian ideas expressed in Eduard Hanslick’s On Musical Beauty. What this boils down to is the very abstract concept of ‘nationalism’ or the idea that ‘indigenous’ people, or people who identify themselves as such, have a natural entitlement over all others. In an international ‘global’ society, are these not, at the very least, questionable ideas? The sense of ‘historic and existing community’ is far too often based on pre-existing entitlements created by historic hierarchies, which have on occasion been either paternalistic or exploitative. Nor do I see equality as ‘abstract’ when one removes the dogmatic notion that everyone should ‘be the same’ and replaces it with ‘equality of opportunities’. Racism is pernicious and has little to do with loyalty to one’s national, cultural or even religious identity. I had always felt that it was the British Right, rather than the Left that drove patriotism towards its racist extremes. The Last Night of the Proms or the Edinburgh Tattoo are hardly National Front rallies – rather, they are invitations for everyone to join into parties that celebrate specific national traditions. Where it becomes cultural triumphalism (equally harmful as ‘racism’) is the declaration that an Irish jig is somehow superior to Jamaican Jonkonnu. Progressive societies share one thing that Scruton is unwilling to acknowledge: the ability to weigh and consider alternative values as legitimate. In a society that believes above all else in the equality of opportunities, alternative values can be assessed and either assumed or rejected. In progressive secular societies, we believe that women and men are equal and with the exception of childbirth, their competences are the same. This however, is not the belief of progressive secular societies, it’s a view that is held as empirical fact. We may prefer women to stay home raising children and writing thank-you notes on scented paper, but society has moved on and shown beyond all doubt that women and men can be trusted with the same tasks. It’s illegal and thus socially irresponsible to deny them rights or education. In an age of mass immigration, it’s important that a society upholds these views in the face of religious beliefs brought by different cultures that globalisation has mixed with our own. Scruton writes that it’s possible to see conservatives as suspicious of ideals, whereas the ‘left’ has ‘canonized’ multiculturalism. I disagree: the ‘left’, if it can be accused of anything, has not ‘canonized’ multiculturalism, but rather, it has been too tolerant of the intolerance of others. Europeans in general have not promoted multiculturalism, but instead, they have isolated all cultures that differed from the own. This is why ghettos have sprung up in England where only Urdu is spoken and in France where three generations on, they still speak Arabic. Had multiculturalism truly been promoted, we would have integrated new cultures and allowed a free flow of ideas and traditions. Why this was not allowed to happen is the result of naked racism – and that has traditionally been a weakness of conservatives rather than the ‘left’. But since when was any of that a ‘conservative’ position? And what – this is the insidious bit – does he mean by ‘way of life’? I suspect, based on his previously stated positions, he would have no time for the decriminalization of homosexuality. Years ago, I remember him writing a sickening article about homosexuals making a far greater contribution to society when they were criminalized. Apparently, we sublimated our inadequate sexual desires into do-gooding. No. Gay-marriage would certainly not fit into the Scruton world-view, and I suspect he may be willing to share this vision of ‘a-way-of-life’ with other intolerant faiths we presently see marauding across the globe. ‘Small is beautiful’ is not new, nor necessarily ‘conservative’. The NSDAP were the first environmentalists. Nobody can argue with most environmental values, until they decide that removing most of the human race is a ‘green’ necessity. Hitler and the NSDAP saw themselves as progressives and valued what they believed to be empirical science above human dignity. We now recognise their eugenic based racism as deadly nonsense. The view that the ‘we’ in politics is superior to some ill-defined ‘them’ has been the tool of populist politics of both the left and the right. Democracy has two, apparently contradictory functions: to allow the majority to decide, while in the spirit of ‘equality’ and ‘freedom’, protecting the minority from those majority decisions that are harmful. Allowing the deeply religious to deny fundamental human rights to women or gays is not in keeping in this spirit. It is this balance between majority and minority that truly determines the differences between left and right. Everyone belongs to some minority. I prefer classical music to pop. Others prefer jazz to classical. Free and equal societies try to make room for everyone. To put it another way: The majority is right-handed, but we no longer, as in earlier times, see left-handed people as a threat to ‘our way of life’. He sees his view of conservatism as the best answer to such earth shattering issues as ‘the EU’ – a ridiculously obvious example of British cultural xenophobia. But he also sees his view of conservatism as the answer to the more complex questions of ‘mass immigration, the environment’ and ‘Islamic extremism’. He says that conservatives would be able to defend ‘our way of life’ if it weren’t for the ‘censorship’ of the left. Given the fact that much of Britain’s media is owned by tax-exiles, or foreign right-wingers such as Rupert Murdoch, I find it galling to read that it’s the left that apparently imposes censorship. The impossibility of having a rational, balanced debate on the EU is, if anything, due to right-wing censorship. Anyone who thinks the EU is fundamentally a good thing for Britain and Europe has been bullied into having to quantify this view with a qualifying ‘but, er – um. . . .of course, in need of reform’. 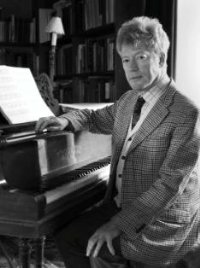 Scruton is like Houston Stewart Chamberlain: a romantic conservative who holds views that appear like an English village in a Miss Marple murder: attractive and outwardly appealing, but harbouring criminal injustice. As I quote in Forbidden Music, Ludwig Stein found that Chamberlain was unable to contemplate the possibility that those things we believed immutable in the past might be disproved in the future. Chamberlain believed that ‘race’ was a given and the determining factor in all cultural, personal and international interactions. Stein dismissed Chamberlain as a Romantic in the same way that ‘all revolutionaries are Romantics’. I don’t see Scruton as a revolutionary, but his belief that the ‘concrete’ geographical placement of people trounce the broader ,‘abstract’ rights of equality and freedom need to be questioned in an age when the world’s peoples are being juggled together. Without such abstract ideas as ‘freedom’ and ‘equality’, I’m not sure how different his ‘way of life’ would be from the one being imposed by religious fanatics in the Middle East. It takes no stretching to apply Scruton’s ideas to Arkansas under Faubus or Alabama under George Wallace, who staunchly “defended” the “customs, the history and the people who are theirs” against “abstract” principles of, as it happens, racial equality. The US Federal governments of Eisenhower, Kennedy,and Johnson had to send US troops to force these regimes to grant African-Americans voting rights, property rights, and educational rights – not to mention freedom from quaint “local” traditions like lynch mobs. I would like to hope that Scruton would have been on the correct side of this issue, but a look at the writings of people like WIlliam F. Buckley during the 1950s suggests that Scruton’s Counter-Enlightenment Theo-Con principles might have led him astray. I found this article by googling for “Roger Scrotum”. Is it the case, therefore, that a scrotum and Scruton harbour the same sort of thing? Or have Google’s search rankings been hijacked by a left-wing conspiracy? If you’re suggesting, what Scruton writes is mostly “balls”…..well, Google might have a point that has nothing to do with left-wing Infiltration.